Understanding and applying Scripture can be tricky business. What principles ought to guide the interpretive process? How important are historical and text-critical issues? What about literary and genre considerations? The number of questions to juggle can feel downright daunting for the ordinary Christian or pastor just trying to faithfully make sense of God's inspired Word. 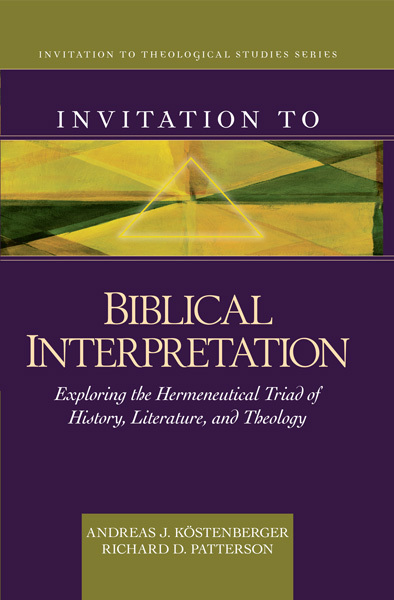 Thankfully, Andreas Köstenberger and Richard Patterson have served the church by writing Invitation to Biblical Interpretation: Exploring the Hermeneutical Triad of History, Literature, and Theology (Kregel, 2011). (I should note that it's probably the most heavily plugged book I've ever seen at 39 endorsements!) In it, the authors examine the Bible's historical context, its literary focus (encompassing issues of canon, genre, and language), and its theological and applicational goal. I corresponded with Köstenberger, director of PhD studies and professor of New Testament and Biblical Theology at Southeastern Baptist Theological Seminary in Wake Forest, North Carolina, about the significance of their “hermeneutical triad” proposal, advice for the discouraged believer for whom Bible reading has become dull, practical ways church leaders might use the book, and more. What does it mean that history, literature, and theology are a hermeneutical triad? How does that influence the overall approach of your book? Whether you are dealing with OT narrative, wisdom or prophetic literature, or an epistle, you will want to study the historical background, literary context, and theological message of your passage. For this reason, we have made the “hermeneutical triad” of history, literature, and theology the overarching framework of our hermeneutical method. After a survey of the canonical landscape, we devote individual chapters to each biblical genre, moving canonically from OT narrative to NT apocalyptic, in which we explore what a “hermeneutical triad” approach looks like when applied to the study of a particular biblical genre. That said, sound hermeneutics means more than simply following any given method. As we guide the reader through the book, we seek to instill the interpretive virtues of historical-cultural awareness, canonical consciousness, sensitivity to genre, literary and linguistic competence, a firm and growing grasp of biblical theology, and an ability to apply and proclaim passages from every biblical genre to life. Toward the latter end, we conclude with a chapter on how to preach from the different genres of Scripture. How does your “hermeneutical triad” proposal differ from others such as the “hermeneutical circle” and the “hermeneutical spiral”? These three proposals—the hermeneutical circle, the hermeneutical spiral, and the hermeneutical triad—are not mutually exclusive, nor is one necessarily superior to the other. Each geometric figure conveys a valid insight. The hermeneutical circle establishes the exceedingly important interpretive principle of understanding each part of Scripture in light of the whole biblical message. The hermeneutical spiral underscores the importance of moving from the ancient text to the contemporary context. Without application, interpretation is not complete. The hermeneutical triad, for its part, points to the triadic structure of the interpretive task, noting that the biblical interpreter is faced with three inescapable realities: historical/cultural setting, the text (i.e., literature), and theology (divine revelation). God has revealed himself in history, and the biblical texts require skilled interpretation, with careful attention being given to the text's canonical location, genre characteristics, and linguistic features (including word meanings and grammatical relationships). As such, the hermeneutical triad embraces and incorporates the legitimate contributions of the hermeneutical circle, spiral, and triad. By starting with the big picture or broadest category, canon, and moving from there to genre (still a very broad category) and finally to the study of a concrete literary unit in its discourse context (with careful attention being given to the specific words used), our method embodies the principle of interpreting the parts (words) in light of the whole (canon, genre). By moving all the way from history (the historical-cultural grounding of a given biblical passage) to contemporary application (the final chapter of our book), we heed the key concern of the proponents of the hermeneutical spiral—that interpretation is not complete until we apply our interpretive insights to our own lives and those of our congregations. You write, “We don't start with analyzing the details of the biblical text (word study); we start with the whole (canon).” Why is this an important approach? As a result, we don't start with words; we start with the canon. Incidentally, this is also how we interpret, say, a play by Shakespeare. We don't just analyze the words in a given sentence, we first try to learn more about Shakespeare, his background, the time in which he wrote, surveying his major works, and so on, before finally settling on a particular play, and then perhaps reading a good summary before eventually delving in and starting to read the book. Even when we encounter a given word with which we are unfamiliar, we may not stop reading, because we are more concerned about following the general flow than identifying individual word meanings. Thus we don't start with analyzing the details of the biblical text (word study); we start with the whole (canon). In our view, this way of proceeding is more intuitive, more true to life, and more likely to result in accurate context-sensitive interpretations. What are some common interpretive mistakes you see in Reformed circles today? Although not limited to Reformed theology, in some Reformed circles a presuppositional interpretative procedure is followed. For some this entails a commitment to theology and/or established creedal declarations, which takes precedence over a balanced hermeneutical approach. In some cases, this involves embracing replacement theology (or some form of supersessionism), which entails a complete transference of the promises made to Israel to the church. Although replacement theology has ancient roots, it stands at variance with the canonical realization of the promises in the Abrahamic covenant (as further progressively detailed in the Davidic and new covenants) not only for individual believers but also for national Israel. Another difficulty emerging from Reformed circles is that of theonomy, which declares that Old Testament law continues to apply today. This sometimes takes the form of reconstructionism, which holds that the divine mandate is that all governments (not just Israel) make Old Testament moral law the legal basis of their country. Such a view fails to take in the canonical data with regard to the mission of the church. Whether in Reformed circles or elsewhere, a presuppositional approach mitigates against a balanced interpretation and understanding of God’s Word. I appreciate how you underscore the importance of the interpreter's heart. What would you say to a discouraged believer for whom Scripture reading has become tedious? As I said at the outset, interpreting Scripture is more than simply following any given method; it is growing in interpretive virtue (see my recent book Excellence: The Character of God and the Pursuit of Scholarly Virtue). We also express our conviction that it is “our love for God and our conviction that God's Word is so precious that we ought to spare no effort to comprehend it as precisely as possible will be powerful motivators as we embark on our interpretive journey.” We are all on a journey, and learning to study Scripture is, to use Paul's metaphor, akin to an apprenticeship, where we learn how to handle God's word accurately from those who have developed interpretive skills before us. We believe that confident and essentially accurate interpretation is within the reach of every student of the Word who applies himself diligently and is willing to do what it takes to progress in this quest. What are some practical ways that pastors and other church leaders might use your book? First, they may want to adopt a triad approach to their study of any given passage of Scripture until studying it in terms of history, literature, and theology has become a habit. Second, they may want to carefully work through the final chapter on preaching through the different genres of Scripture and adapt it to their own preaching style. Third, they can use the individual chapters on interpreting the different genres of Scripture as a resource whenever they study and/or preach through a particular type of biblical literature. They may also want to use some of the concepts in the book and teach them to others. We have heard encouraging reports from teachers in local churches and cross-cultural situations who successfully taught a “hermeneutical triad” approach to others. Chapter quizzes, a study chart, PowerPoints, and a syllabus shell can be obtained from Kregel. I would also love to receive any feedback on the book at my website.